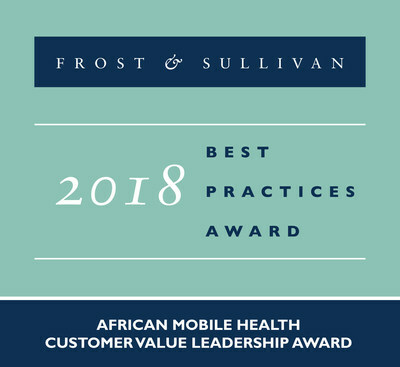 LONDON, April 9, 2019 /PRNewswire/ — Based on its recent analysis of the African mobile health market, Frost & Sullivan recognises Kenya-headquartered AfriDOKTA with the 2018 African Customer Value Leadership Award for its hybrid telemedicine/mHealth platform. AfriDOKTA is a subsidiary of eHealth Solutions LLC, a global company based in the United States, which is a leader in developing outcome-based electronic healthcare solutions. Through its telemedicine/mHealth solution, AfriDOKTA aims to deliver first class and world class healthcare to African countries and other low and middle-income countries challenged with major health burdens, regardless of their location and socioeconomic status. Unlike most mHealth platforms in Africa, AfriDOKTA complies with international data security standards and adheres to the US-based Health Insurance Portability and Accountability Act (HIPAA). The company also applies Health Level 7 (HL7), SNOMED, and DICOM standards, which are a set of international principles used for the transfer of clinical data between various software and electronic applications. AfriDOKTA’s use of international standards for storing, accessing, and processing medical images and related information is a strong competitive differentiator in the market. Each year, Frost & Sullivan presents this award to the company that demonstrates excellence in implementing strategies that proactively create value for its customers with a focus on improving the return on the investment that customers make in its services or products. The award recognises the company’s unique focus on augmenting the value that its customers receive, beyond simply good customer service, leading to improved customer retention and customer base expansion. Led by Dr John Gachago, Kigen Kandie, Michael Ranneberger, Ken Saul,and Dr. Lawrence Adu and Maragaret Bekker, AfriDOKTA is a team of professionals passionate about transforming the delivery of healthcare in Africa through people, processes and technology. The organization’s mission is three fold; transforming access to healthcare on the African continent; helping African nations meet SDG3 goals; and facilitating the attainment of affordable Universal Healthcare. AfriDOKTA maintains offices in both the US and Kenya. In the US HQ known as eHealth Solutions LLC and in Kenya as E-Health Solutions Ltd, AfriDOKTA seeks to partner with African and other LMIC Ministries of Health as well as health system strengthening partners like USAID, DANIDA, DFID and various foundations like BMGF, Rockefeller and Ford Foundations to augment their efforts in healthcare in a data driven yet contextual fashion. We understand that many organizations seek to strengthen healthcare in Africa but the data needed is absent. AfriDOKTA fills that gap with its unique platform designed based on a combination of experience in the US health information technology market and consulting with multiple Ministries of Health in Africa on national eHealth strategy. By downloading the app from the Google play store or visiting https://AfriDOKTA.com anyone with a smart phone or internet access in Africa would have immediate access to first class and world class quality outpatient care.